Design Miami — erin pellegrino. Welcoming all to Design Miami, Pitch takes the vinyl tent as a provocation, not to reconsider the canopy as an overhead shelter, but to rethink the ground—to pitch the tent upside-down as a landscape. Visitors enter and exit the fair over, under, and through a geometric landscape that is both familiar and unexpected: structurally and materially similar to the existing tents, yet habitable and spatial in new ways. Sloped surfaces provide shaded seating for events and leisure, framing a courtyard and reorienting the entrance toward the Botanic Garden, Convention Center and the ocean. The interior surfaces of the pavilion are covered in low-resilience polyurethane ‘memory’ foam, which provides a safe and comfortable surface for play and relaxation. During the week of the show, the constant deformation of the foam is gradually imprinted on its surface and becomes a record of the event. 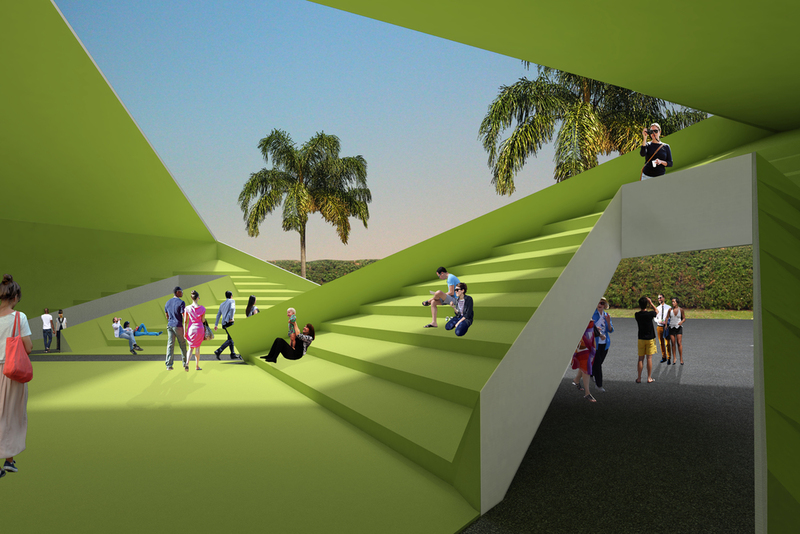 In addition to the two existing Design Miami tents, the underside of the large slope is used as a partially enclosed public exhibition space. This ‘third tent’ will feature work from the Harvard Graduate School of Design, and will extend the fair-going experience to all visitors. Pitch is a play on the materiality and geometry of the tents as its immediate context, but also as widely recognizable features of Design Miami. At the conclusion of the fair, the pavilion will be recycled; the steel and aluminum will be processed at local facilities and the PVC membrane will be cut and manufactured into Design-Miami branded umbrellas, as a final iteration of the tent particularly well-suited to Miami’s beach culture. Rather than propose a stand-alone pavilion independent of the larger event space, Pitch is a mediating interface—a vibrant public platform for Design Miami. Like a landscape, Pitch is illusory. From one view, it seems to extend out from the tents. From another, it is an excavation. The Design Miami logo is similarly animated as an anamorphic projection, coming into and out of alignment as visitors approach and enter the pavilion. After circulating through the exhibitions, fair-goers exit the tent into a small oasis and join passersby on the slopes. This new terrain is a destination against the flat ocean horizon so familiar to Miami—a space of gathering and exploration. Collaboration with Mikhail Grinwold, Katie MacDonald and Jake Rudin. © 2019 Make Think Design, LLC. All Rights Reserved.